Most advanced market democracies are pervaded by laws and rules that structure social and economic relationships. Navigating these rules requires significant amount of legal information and guidance. 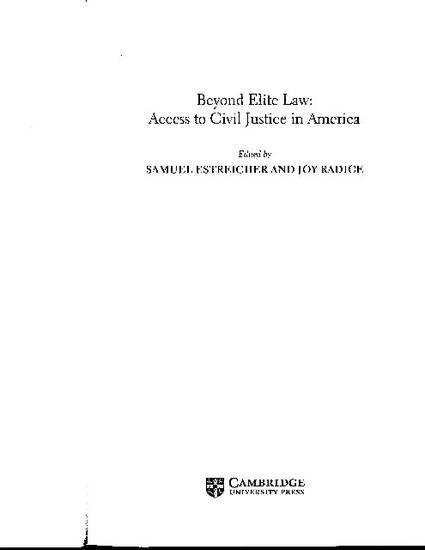 The vast majority of ordinary Americans, however, lack significant access to legal resources. In this paper we explore the limited amounts of empirical data available to document the legal resource landscape for ordinary Americans. We demonstrate that Americans experience legal problems with at least the same frequency as do people in other countries but by and large they are left to manage these problems with little legal help. A higher fraction of Americans “lump” their problems—doing nothing to resolve significant difficulties with housing, employment, family relations etc.—or represent themselves in court than is the case in places such as the U.K. and the Netherlands. We highlight what we believe are two important reasons for the limited options available to ordinary Americans dealing with legal problems. First, the U.S. devotes lower levels of public resources to the legal system when we adjust measures of public expenditures on the court system, public and charitable legal aid, and numbers of lawyers and judges to take account of the much higher numbers of cases in U.S. court systems. Second, the U.S. legal profession exercises a much tighter grip on legal markets than is the case in places such as the U.K. and the Netherlands, where there is much more robust set of options, beyond attorneys, to provide ordinary people with legal assistance.